Blurb is a Verb: Who Reads eBooks? I have written before about the excellent resources Random House provides its authors. This month their newsletter contains a breakdown of new Pew Research data about who reads eBooks. Some of the info is not groundbreaking--readers of eBooks are 2.5 times more likely to own a tablet. I was particularly interested in the genre breakdown. 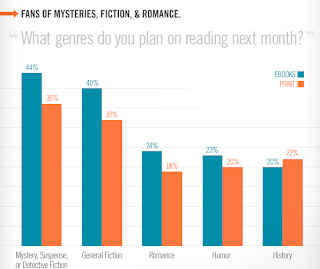 I'd already understood that eBooks were changing the romance market, but I didn't know that general fiction was even bigger! You can read the full article here. And you should! This snippet is part of an infographic by Random House. Click through to see the whole thing in impressive and dazzling detail.